By Jake Rocheleau in Toolkit. Updated on December 7, 2017 . Well, now you can embed data straight from the CanIUse website with this unofficial embed tool. It’s completely free and works really well. It is by far the best way to include all support data for the top 10 major browsers of anything you like. Everything is pulled straight from the CanIUse website, so it’s robust and incredibly accurate. Just make sure you update the embed code to pull the latest source. These embed features include options for external linking and global percentage data for each browser. The only thing you need to get started is this script that you can download locally or add to your site from that CDN link. From there, you can generate a custom embed code by selecting which feature you’re targeting & how many browser levels you want. I’ve seen these CanIUse tables added to dozens of web design & development blogs around the web. They’re invaluable for tutorials and they can help developers make a case for using certain features in their projects. I mostly appreciate this embed tool for the detailed value and quality craftsmanship. Just like the CanIUse website itself, it’s also fantastic and one of the best resources for any web developer. 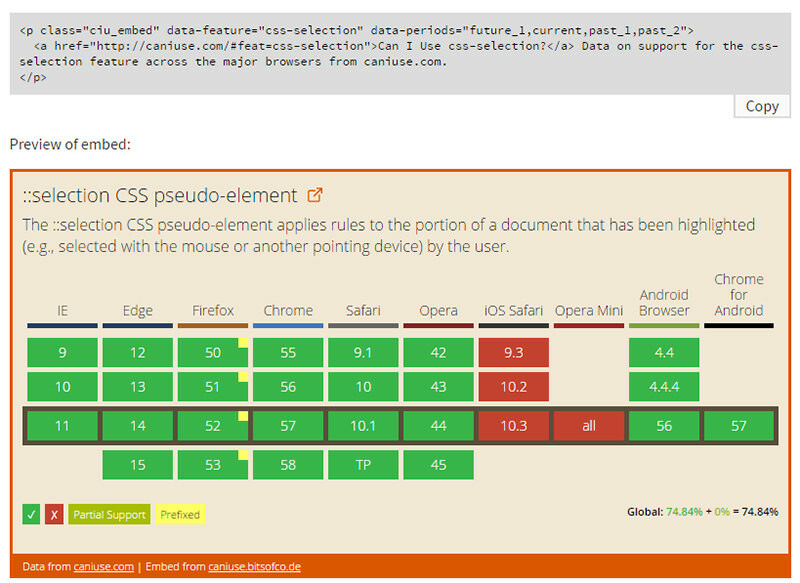 And, if you’re a user of Web Components check out the CanIUse embed component that can save you a good amount of code. Just note this site is an unofficial resource, meaning it’s not officially endorsed by the CanIUse team. But, the quality is so high that I’d guarantee it’ll be around for the long haul. To learn more, check out the embed project site or tweet the creator Ire Aderinokun on her Twitter account @ireaderinokun.